Well, things don’t always go according to plan, do they? After beating their arch rival Green Bay, 24-17, on Sunday, the Bears officially clinched the division while improving to 10-4 — a major surprise given that most preseason projections pegged this as a six-win team. Then again, considering Chicago had won only 14 games over the last three years combined, it was a little tough to see this kind of step forward coming, right? Hell, Da Bears have even been great to wager on, going 9-4 vs. the spread heading into Week 15. So what happened to spur such a major turnaround and Chicago’s first playoff appearance since it last won the division in 2010? For starters, quarterback Mitchell Trubisky has taken a major step forward in his second season. After a stellar performance against the Pack (20-for-28 for 235 yards with two touchdown passes and no picks), he’s now closing in on 250 completions after managing fewer than 200 as a rookie. Trubisky’s completion rate has soared from 59.4 per cent to 64.9 per cent, and while he’s been picked five more times (in 49 more attempts), he also has 16 more touchdown passes this season. It’s an incredibly exciting prospect for Bears fans as this kid still has so much more upside, but the fact that in just Year Two he’s been named to the Pro Bowl game (one of five Bears picked to play this season) and has put together one of the best seasons ever by a Chicago quarterback bodes extremely well for the future. As for the present, Trubisky does not seem overwhelmed by what he and his team have accomplished at all (see video below). 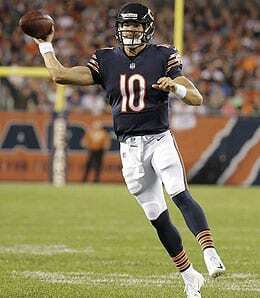 With Chicago next facing a 49ers team that has given up a lot of TD passes lately, consider Trubisky a low-end QB1 or fantastic QB2 for Week 16 as you fight for your Fantasy championship. Lost in the elation of finally beating Green Bay (after losing nine of the previous 10 games against the Pack) — and officially eliminating the Packers from the playoffs — were some health issues. Chiefly among these is that Pro Bowl safety Eddie Jackson — who came up huge Sunday with his sixth interception of the season — suffered an ankle injury. He had to skip practice Wednesday, but the team hopes the injury will not end his season prematurely. Jackson doesn’t have as many assisted tackles this year, but has recorded his first ever sack and has way more passes defended and picks. If Jackson can return for the playoffs, it will make this team all the more dangerous. After starting the season by splitting its first six games, Chicago is now on a 7-1 roll, making it among the NFL’s hotter teams at the exact right time. We’re not sure the Bears are ready to topple New Orleans or the Rams for NFC supremacy, but their odds of winning the Super Bowl are one hell of a lot more feasible now than they were heading into the season. Now it’s your turn. Let us know in the comments below how you think the Bears will do in the postseason. Fantasy owners had to love the fact that his worst game came early (32 yards in Week Two) and was followed up by three straight games with an end zone visit. All MVPs need a “signature moment” — Gronk’s came in Week Eight against the Chicago Bears when he amassed 149 yards on nine catches en route to three touchdowns. Through Week 15, he may only have three 100-yard games but he also has scored 11 touchdowns, and we believe his consistency is the biggest reason he is deserving of this award. A five-catch, 68-yard day is a decent line for most tight ends — but that’s Gronk’s second-worst game of the season. All of 2014’s other Fantasy Stud of the Year candidates are not even definitively the best at their position and anyone trying to argue for a tight end other than Gronkowski in 2014 needs to be drug tested. e must give him some credit for showing the football world that a tight end can be an impact player. If you roll back the clock back you will find he was the first real productive tight end. Ditka was force for the Chicago Bears as a rookie in 1961 when he scored 12 TDs and went over 1,000 yards receiving. His average yard per catch was staggering 19.2. “Iron Mike” was Rookie of the Year and he eventually went on to be the first tight end selected to the Pro Football Hall of Fame. While he never topped his rookie stats he was still a feared player throughout his career. With Peterson out for at least one game with his high ankle sprain, the Vikes (and countless Fantasy owners) will turn to Gerhart to try to overcome the loss of one of the game’s most elite talents. Sorry, it won’t happen — but Gerhart should at least be in line for goal-line work, as his 230-plus pound frame makes him a load in the trenches.